Michael Hancock is a PhD candidate at the University of Waterloo, and book reviews editor at FPS. He is also sad no one has yet submitted a review of McKenzie Wark’s Gamer Theory. At the moment, I’m playing Level-5 and Studio Ghibli’s Ni No Kuni: Wrath of the White Witch, released about a year ago on the PS3, which means it just reached the top of my Games I Meant To Play Last Year list. (I’ll get to you some day, Gone Home.) While I’m not done playing yet, I’ve got one word to sum up the experience: paratext. Bear with me for a moment, because this is going to take a somewhat lengthy (yet informative and surely entertaining) digression. While sadly no one has submitted to FPS a review of Mia Consalvo’s Cheating or Steven E. Jones’ The Meaning of Video Games, both books consider paratext in the context of videogames. Paratext can be loosely defined as anything that influences a reading of a text that’s not part of its main content. In Consalvo’s case, paratext includes looking at how players and magazines like Nintendo Power get positioned as experts on certain games. In Jones’ case, it includes looking at things like how Nintendo’s Wii commercials created a sense of how its games were meant to be played. Technically, all of the examples of paratext I’ve listed thus far really fall within a subcategory of paratext called epitext, which includes all paratexts not specifically included in a text, and those that are included are called peritext. In a videogame, the line between peritext and just text gets blurry quickly. Is the title screen a peritext? What about the achievement list? Or the Head-Up Display? 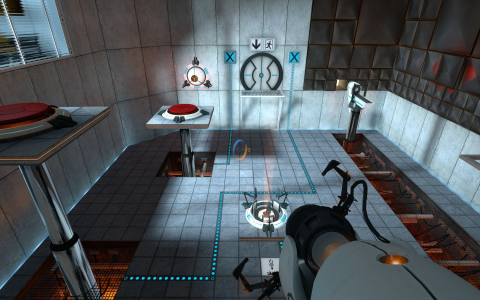 On his blog, Robert Yang makes a convincing case that even the unportalable walls of Portal constitute a paratext, in that graphics making good use out of the technology reinforce the value of a videogame, particularly an AAA videogame. The white walls support portals, while the metallic black walls do not. Further, every feature a sandbox game adds, every mini-map icon, crafting system, and side quest, contributes to the notion that the game is vast and therefore valuable. Essentially, feature creep is a sort of paratext. And that, finally, brings us back to Ni No Kuni. In terms of its paratext, it is the most JRPG-ish JRPG I’ve played in a long time. The combat system reminds me of Tri-Ace’s previous game, Rogue Galaxy, with its hybrid of movement and menu systems. The options to catch familiars and evolve—sorry, metamorphose —them into stronger forms through feeding them special items will be very, very familiar to Pokémon fans. It’s not a bad game, by any means. I love its commitment to the lore of game (the Wizard’s Companion is a seriously paratextual addition), and the blend of earnestness and wonder that is the hallmark of quality child-oriented fantasy. But I wonder: Am I playing it for the paratext, or in spite of it? What does this game mean to people who haven’t played dozens of JRPG ports for the last twenty years? And, maybe most damningly— if you take away the paratext of what’s already been done, what’s left? Rob Parker is a Contributing Editor at FPS. He holds an MA in English & Film Studies from Wilfrid Laurier University & is currently working on an MA in Experimental Digital Media at the University of Waterloo. His main areas of interest are genre theory, creative writing, interactive fiction, and roguelikes. Like Michael, I’ve been reading a fair bit of Mia Consalvo’s fantastic book, Cheating. After watching several people stream themselves attempting (and often spectacularly failing) the Spelunky daily challenges, I’ve been thinking about the roguelike genre (games that frequently feature procedurally-generated levels, permanent or non-trivial death penalties, and obtuse mechanics) in constellation with gaming capital. In Cheating, Consalvo spends a lot of time talking about how players circulate and display their game knowledge. Whether it was through reading Nintendo Power and passing those tips on to their friends or through writing walkthroughs/online guides. Roguelikes tend to resist these approaches, since the levels are randomly generated, and many important mechanics are frequently obfuscated from the player. The Spelunky daily challenges are the same map for every player, but that player only gets one chance to play through it, creating a wave of impromptu walkthroughs, warnings, and strategies within that community every time the daily challenge resets. Part of this thinking spilled over into considering the roguelike as a genre. As Tanya X Short noted in a fantastic piece over at Gamasutra, “Never Say Roguelike,” the term is extremely unclear to players that have not already been exposed to it. This prompted Lars Doucet to suggest a term that is a little more descriptive (“On Procedural Death Labyrinths”). I’m not quite ready to fully weigh in on the viability of Doucet’s term, but it does emphasize the aspects of this type of game design that seem to most coincide with Consalvo’s concept of gaming capital. In addition to resisting repeatability by randomly-generating levels, the emphasis on permanent death or at least highly punitive death mechanics in roguelike design immediately places a premium on strategies and tips that players can share with one another to avoid dying. Furthermore, by evoking the figuration of the labyrinth, a confusing structure that hides an unknowable horror, Doucet’s term also gestures at the importance of obtuse knowledge to roguelike design. The idea of obtuse knowledge is perhaps most keenly explained in Douglas Wilson’s Polygon article about the solo eggplant run in Spelunky. To this end, I’ve started streaming myself playing a variety of roguelike games (on Twitch with the username RobotParking) and following those streams with a more critical sort of after-action report. So far, I’ve only been able to stream Brogue, a free and very user-friendly but still “classically-inspired” roguelike, but I’ve been working on a rough schedule that includes Teleglitch, Steam Marines, Dungeons of Dredmor, Cataclysm, Dungeon of the Endless, Tales of Maj’Eyal and (assuming I can get it to work still) the winner-designed roguelike experiment Mercury made by James Lantz. In particular, I’ll be focusing on how these games treat death, emphasize the necessity of occulted knowledge, and how each game’s slightly different approach to procedurality complicates its relationship with the accumulation of gaming capital between players.